Triphala is one of the most commonly used Ayurvedic remedies. It’s made from the dried powder of three different Indian fruits, combining equal parts of haritaki (Terminalia chebula), bibhitaki (Terminalia bellirica) and amla (Emblica officinalis). You may see it called triphala powder or triphala churna. The Ayurvedic term “churna” simply refers to a mixture of powdered herbs or minerals. Triphala has traditionally been used to treat a variety of health conditions, and modern research is starting to back up many of these uses. Let’s take a closer look at some of the key benefits of this classic remedy. Triphala is shown to inhibit the growth of cancer cells. A 2008 study found triphala was able to promote cell death in human pancreatic cancer cells. Another study revealed that triphala promoted breast cancer cell death, while it had no effect on healthy breast tissue cells. Triphala may also inhibit prostate and colon cancer cells. Researchers suggest triphala’s cancer-fighting ability may be due to its high content of gallic acid, which has been shown to have cytotoxicity against cancer cells, as well as having antioxidant, anti-viral and anti-fungal properties. In addition, triphala has the ability to stimulate your immune system. Volunteers who took 3 capsules of triphala per day for 2 weeks had significant increases in their cytotoxic T lymphocytes and natural killer cells. Immune support can be critical for fighting cancer, as well as many other diseases. Some of the chemical compounds in the fruits of triphala are known to promote healthy gut bacteria, while combatting harmful ones. 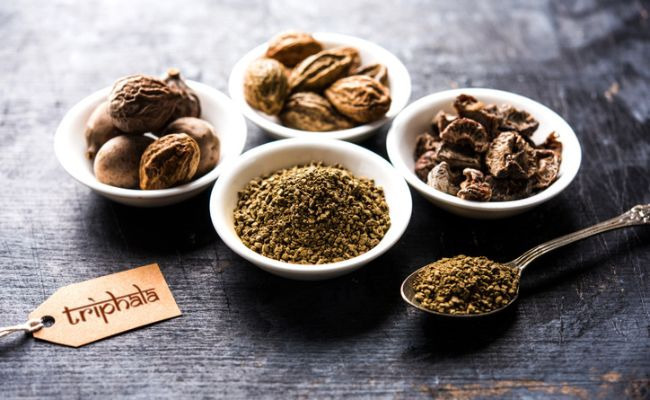 Researchers suggest this may be why triphala can be used to benefit many digestive issues. The herbal blend actually promotes a well-balanced gut microbiome. Triphala is commonly used as a laxative, but one study found that those who took a triphala preparation for one month had many other digestive benefits. The amount, frequency and consistency of their bowel movements improved. The participants also noticed a reduction in odor, flatulence, belching and abdominal pain. The researchers pointed out that none of the participants had any adverse effects during the study, which suggests triphala can be used safely to treat constipation and other digestive issues. In a 2012 study, a group of obese volunteers took 5 grams of triphala twice a day for 12 weeks. At the end of the study, they had significantly smaller waist and hip circumferences than those who had not taken triphala. Also, each person in the triphala group had lost almost 5 kg (11 pounds) more than those in the control group. The study also found no adverse effects or changes in liver or kidney function in those who took triphala. It’s unknown how triphala benefits weight loss, but it appears to be a potentially safe addition to a weight loss program. Those with type 2 diabetes were shown to have reduced blood glucose levels after taking 5 grams of triphala powder for 45 days. Certain chemical constituents in triphala are known to improve insulin function and glucose uptake without increasing the creation of fat cells. This may be one way that triphala can reduce blood glucose and insulin levels. A few different animal studies have shown that triphala can reduce cholesterol levels, as well as atherosclerosis. Atherosclerosis refers to the build-up of plaques in your arteries. It can be caused by high cholesterol, and it can lead to more serious and potentially fatal heart diseases, such as coronary artery disease. Triphala’s ability to reduce cholesterol and atherosclerosis has the potential to prevent these diseases from starting. Many of us suffer from chronic inflammation in our bodies from ongoing stress, illness and other causes. And chronic inflammation is known to promote other diseases, including diabetes, cancer and obesity. Triphala is shown to help reduce inflammation. In fact, one 2015 study found that triphala was more effective than indomethacin, a common anti-inflammatory drug. Also, the fruits used in triphala are proven to be very high in antioxidants, which help reduce inflammation on a cellular level. And research suggests their anti-inflammatory action is enhanced when they’re taken together in triphala powder, instead of taking each fruit alone. Triphala has been shown to significantly reduce oral bacteria, dental plaque, gingivitis and periodontal disease. In addition, rinsing twice a day with a triphala mouthwash has been shown to reduce Streptococcus mutans, which is responsible for the majority of cavities. If you’re interested in adding a triphala mouthwash to your daily routine, prepared mouthwashes are available commercially. You can also try Bimbima’s simple recipe for making your own triphala mouthwash. In general, research has found that long-term use of triphala has no significant side effects. But, some users have reported gastrointestinal upset when taking triphala, such as diarrhea and abdominal discomfort. This often happens when it’s taken in large amounts. Triphala is also not recommended for children and pregnant or nursing women due to limited research on its safety for these groups. Triphala may interact with other medications you’re taking, such as blood thinners. It’s important to speak to your doctor before taking triphala or any other herbal remedy to make sure it’s right for you.